When Carmina Burana reached the point of production in 1936, Carl Orff wrote to his publisher in definitive terms about his earlier output: “Everything that I have written until now, and that unfortunately you have printed, you can now convert into waste paper. My collected works begin with Carmina Burana.” For the rest of his composing career Orff stuck – many might say too obsessively – to the same metronomic style that he had thus so enthusiastically embraced. To discover then Gisei, his first opera written at the tender age of seventeen, is a startling revelation. Orff himself had done his level best to discourage any interest in the score, writing disparagingly of the work in his autobiography in terms designed to forestall the interest of any potential producer. It was not until twenty-eight years after his death that the enterprising Darmstadt Opera mounted a first production – and, presumably first performance – of the work in a version which has already appeared on DVD in what looks like a surprisingly traditional production. This new recording lacks the visual element, but the score is able to hold its own without that. In any event the plot, a rather distasteful Japanese story about a boy who is killed as a substitute for a hunted heir to the throne, with what seems to be the willing connivance of his own parents seeking to expiate their own sense of guilt. This means that none of the characters even begin to engage our sympathy and one is simply left with a feeling of generalised pity for the inhumanity of the world. What is more surprising is the nature of the score. The very opening, with a distant wordless chorus, sounds for all the world like a scene from Delius’s score for James Elroy Flecker’s haunting oriental play Hassan — not written until some ten years later. Then comes a theme which I think is meant to represent redemption — it recurs at the very end of the opera — which is a very close relative to the opening of Delius’s Requiem, also not written until after the First World War. The use of a Japanese story, considerably elaborated and expanded from its original by the composer, might lead one to expect some echoes of Madam Butterfly. This is over and above the humming chorus which recurs at several points, as well as a direct use of a Japanese melody also employed by Puccini. In fact there are echoes of other Puccini operas as well, most notably Tosca, including a final chord which sounds in its scoring and unusual harmonic spacing almost identical to that at the end of Act Two of that opera. Add to this conscious and very noticeable echoes of Debussy’s Pelléas et Mélisande — Orff acknowledged the influence of Maeterlinck on the construction of his libretto — and we have a heady mix indeed of late-romantic and impressionist styles. There are also echoes of other composers, as one might expect, but the brief appearance of the Lord Chancellor’s theme from Iolanthe during Genzo’s monologue (track 11) is curious indeed. In his booklet note Andreas Meyer claims that there are clear pre-echoes of the later Orff; but, apart from the opening of the opera itself, after its lengthy prologue, which hints very distantly at Uf dem Anger from Carmina Burana reflected through the prism of Der Mond, I can really find little to substantiate his contention. What is perhaps not so surprising is the inexperienced Orff’s faulty dramatic pacing. On several occasions dialogue that should flow swiftly forwards is held up for purely musical reasons. At other points the composer does allow plenty of time for the scene to make its effect as in the moving prologue and final scene. There are also some frankly awkward-sounding passages of scoring, as in a lengthy passage leading up to the monologue for Genzo (track 10) where what sounds like an uneasy (and ill-tuned) combination of double bassoon and double bass solo have a sort of obbligato counterpoint to the vocal line. At other points the scoring for solo brass has a rather uneasy and unmotivated feel to it, and the lack of melodic profile at any point in the vocal line — with the exception of a little folksong for Tonami — is a serious drawback. The score appears to be composed on Wagnerian lines, leitmotifs and all, but the motifs themselves are not ideally memorable and the overall result is rather closer to Schreker or Braunfels than to Strauss or to Wagner. Then again, the sheer beauty of the orchestral writing that one finds in Schreker or Braunfels is somehow missing. One is left with an uneasy feeling that Orff here was still trying to establish an individual style – and it took him a long time to discover it – without really coming to terms with it. It is a very interesting work, and one which well deserved its exhumation from the vaults, but not one which is ever likely to establish itself on operatic stages except as a curiosity. The execution and recording, taken from a pair of live performances although without any evidence of the presence of an audience, may not be the last word in perfection. The male voices generally come across better than the female ones – both Helzel and Zhidkova sound stressed on higher notes. They are all too closely observed by the microphones for comfort and McKinny sounds gritty in his lower register. One would also have welcomed greater resonance and general warmth from the orchestra under Jacques Lacombe. One or two passages which sound distinctly out of tune suggest that more rehearsal might have also been required. On the other hand, the presentation of the single disc is excellent. The booklet note is perhaps rather strictly technical, and spends too much time arguing the toss with previously published analyses of the opera. We are given the complete text and very substantial stage directions along with a generally satisfactory translation into English. Allow for one reference to the child as “a mama’s boy” which strikes a rather jarring note. The recording of one of Orff’s prentice works is however to be welcomed, especially since I would not imagine that a rival is to be forthcoming anytime soon. 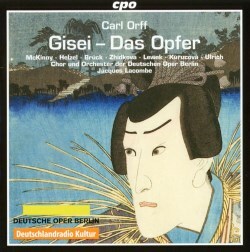 Those who like Orff’s later and more characteristic music — and I must admit that I find it attractive, especially the decidedly under-rated Der Mond — will enjoy making the acquaintance of an opera that the composer himself was at pains to conceal from the world. Those who enjoy mystifying guests will find it an endless source of amusement, since there is almost nothing here to give away the identity of the composer. Indeed there is much to mislead ‘blind listeners’. Others may find the magpie nature of the styles in the score annoying, but even they will find entertainment in spotting the influences on the young composer. A great dramatic experience Gisei is not.